J&J Truck Bodies & Trailersneered for 9 ft and 10 ft bodies for medium duty chassis, the DynaHauler MDC is available in steel and aluminum dump bodies. The standard steel body includes a 3/16-in. A440 full width floor and a 2x4 in. x 3/16-in. structural tubing top rail. 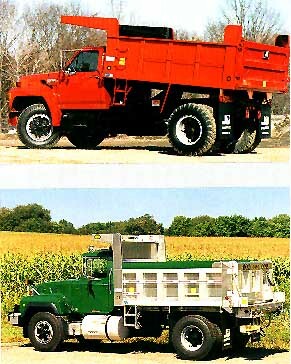 Both units feature sideboards, a cab protector, self-cleaning inside shredder plate, ladder and steps, tarp rods, rear mud flaps and front mud guards, and a back-up alarm.